Chocolat, upon a first watch, is a charming and relatively harmless love story, albeit slow to develop. Its overt themes, at times, come across as trite wolf-in-sheep’s clothing, and these developments follow oft-overused stereotypes. We’ll notice that Chocolat‘s characters don’t exhibit special traits: enhanced strength or intelligence, troubled exposition or abusive relationship history, exaggerated wealth or circumstance. 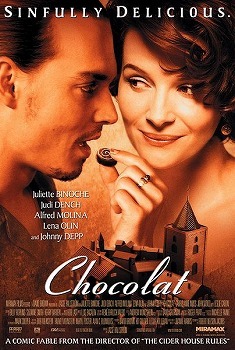 2000’s Chocolat earned its Best Picture nomination through strength of motif (mostly) and acting (somewhat). Further, the more one watches films looking for certain motif strains, the more obvious when one immediately and strikingly sticks out. For Chocolat, this motif is magical realism, the tendency for everyday, or inconspicuous, objects to exhibit supernatural properties. The author or auteur will (often) use this technique to foil, or exacerbate, a truly deeply seeded idea, usually one that has a negative connotation. In Chocolat, prescriptively, the use of chocolate is used to exacerbate the concept of hegemony, stasis and resistance to change, and it quite successfully succeeds. The use of magical realism in a French context is both unexpected and cognitively dissonant. The French, historically, have been associated with amour and whimsy; we never read, see or hear about (or: our media and “history” doesn’t present) the relative orthodoxy of non-Parisian France, pre-telecommunication. A closer look, though, will demonstrate religious intensity skewed heavily toward Catholicism, and that this strain of Christianity overwhelmingly includes older generations: setting Chocolat during a modern reformation period reflected the tyrannical hegemony of stasis. Because overall mood had already begun to shift, Director Lassie Hallström, drawing from Joanie Harris’ 1999 novel of the same name, can cause enough of a “stir” without that “stir” being the sole cause of the action. In other words: Chocolat attempts to unpack a time when order and orthodoxy had been accepted (or forced-accepted) and any deviation was considered immoral. Magical realism attempts to deconstruct this theory and reject the hypothesis through absurdity and fanciful actions: because we, the audience know that the plot is technically impossible, we automatically shift to attempt to realize, “what does this mean?” When executed properly, this effect is powerful; when executed poorly, we get two sequels of The Expendables and four-plus of Transformers. For Chocolat, our beacon for magical realism is Vianne Rocher (Juliette Binoche), a woman with gypsy-like wanderlust and an uncanny ability to produce particular chocolate to suit particular tastes. The chocolat is, of course, a small metaphor within the realm of Chocolat‘s heady magical realism motif. But as Rocher is our realism catalyst and chocolate is our metaphor, the magical realism arrives in the form of cause-and-effect. For example: when a lonely and disgruntled femme au foyer accidentally wanders into Rocher’s shop, Rocher hands her, for all intents and purposes, “horny” beans for her husband. Another: Rocher’s landlady has a tenuous relationship with her kin and is a free-spirited grump until Rocher rents the space from her and starts feeding her quotidien chocolate. To wit: a “crazed” woman whose abusive husband has quelled any and all sense of sanity and passion and who struggles with the idea of happiness, freedom and solidarity, unwittingly realizes herself under the guise of Rocher and her chocolate “magic.” Undoubtedly, the cause of Rocher’s presence leads to the effect of change, but her sudden appearance begs the question “chicken or egg?” as if to say, Rocher was a marvelous catalyst of the magical variety, but the world provided all the change using the most magical element: time. Was 1959 going to spur a new era anyway? It’s almost impossible to say for sure, but certainly this hypothetical movie of “time passing,” holds the title of the most boring way to spend two hours. But what allows Chocolat to stand out even more is multi-layered magical realism through extra characterization, which appears as Johnny Depp. Depp, at this point at his height of popularity, adds not only genuine star power, as if Binoche, Alfred Molina, Carrie-Anne Moss and The Dame, wasn’t already brimming with multi-national talent. But Depp’s character, the nomad called Roux, adds non-magical realism to Rocher’s life and is in turn a catalyst for her to some extent – in a way that gives Chocolat worthwhile depth. The gypsy people have long been associated with the supernatural, most likely in anecdote because the lifestyle is considered hyperreal: who would want to live day-to-day with no guarantee of security at all? Who could raise children in such an environment? Thematically, then, it’s no coincidence that Roux and his “family” arrive almost simultaneously with Rocher and her child. Importantly, all the “groups” involved in this charming and relatively harmless story help to affect one another, both quotidien and en réalité. Together, Roux and Rocher do more good than either alone for the lonely French village, so rooted in orthodoxy and boredom that the magic almost spills out onto the canvas, filled both with chocolat and progress. The year 2000 is significant in film history because as the world geared up for Y2K, digital film faced a dangerous threat from the potential failure of modern technology. Most films bounding 2000 were still recorded onto actual film; in 2014, filming onto reels is now considered passé, expensive and conspicuous (the latter two holding more weight. Most directors have a preference and some film requires the technique to help mirror a theme or a specific period. 2000’s winner, Gladiator, captures the essence of the SPQR by bounding the images to an older technique. Erin Brockovich, another nominee, is striking in story, yes, but more specifically in color effects. While more technical within the digital format, there’s a realness and depth to the color, which adds to the overall bleakness of the story. The other two, Traffic, and the foreign masterpiece, Crouching Tiger, Hidden Dragon (one of the only non-US films nominated for Best Picture, which also happens to traffic in magical realism) both make use of film, rather than digital: not necessarily as pastiche, but as conspicuous choices to enhance the film. Gladiator, the Roman epic, has cemented its place as not only one of the best (top half of winners) films of all time, but also one of the most re-watchable. And while Chocolat tells a fanciful story with subtle magical realism, Gladiator is the one that really does capture the magic of film.